stick shift: any tips or techniques? so i just got a manual honda and i love it. the only problem is that im worrying about ruining my clutch. what are some tips or techniques that you guys use to lengthen the life of the clutch? i know ur not supposed to ride the clutch and the more you use the more it burns out. when i release the clutch quickly during shifting into second or third the car kinda jerks and is not as smooth as when i release it slowly. is this bad for your car? Re: stick shift: any tips or techniques? This is your first manual car?? Just take it easy and get comfortable. it will take time for you to know exactly how you car drives. Good Luck! The easiest and best way to learn to drive stick is to go to a parking lot, put the car in gear, take ur foot away from the gas entirely, and very slowly inch ur clutch foot off the clutch. If u do this slow enough and correctly the car will start to go and u wont stall it. What this does is it teaches u the friction point of the clutch (where it grabs). Once u get this down n get used to it then start using the gas also for a normal pull out. Hope this helps. rest your foot on the dead pedal, not the clutch pedal...! Shift your car around 2-3k and it won't jerk as much. Practice, practice, practice!!!! Like said find out the sweet spot of the clutch and don't it out fast. Nice and easy lol. Go with these guys! Best thing you can do is go to a parking lot and just pratice pulling off in first gear. once you can do that nicely the rest should come a bit more naturally. Hill practice will make you muuuch better. And overall rowing through the gears you should develop a good feel for it as you drive the car. Just think about it and be deliberate and after a week or 2 you should be golden. 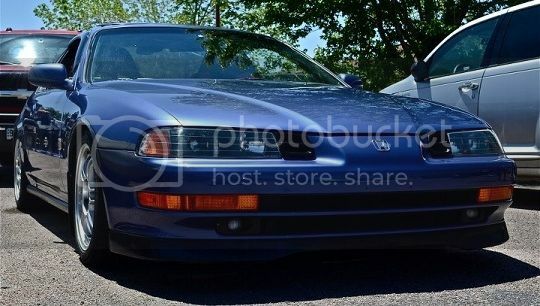 My Prelude was also my first manual car in October. I spent 2 hours in a parking lot at night and got the hang of it. Pissed me off cuz it was so hard but I already bought the car so I had no choice. Now I'm able to go up a steep hill. Practice makes perfect. no one is going to know your car better than yourself. yep its my first car. i saw a few videos on youtube that suggest finding the friction point and i will def try that out sometime.